The City saves money and natural resources by decreasing the waste generated through its own operations and within the larger city limits. This includes both residential and commercial waste reduction and recycling programs. The City diverts thousands of tons of waste from the landfill each year, saving over $1 million annually through waste disposal cost avoidance and recycling revenues, while reducing carbon emissions and conserving natural resources. Additional information is available on the One Simple Act webpage. 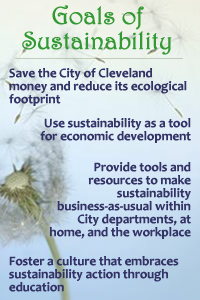 The Transforming Waste into Wealth video, which premiered at Sustainable Cleveland's 2014 Annual Summit, highlights ways that people are taking action around zero waste at home, at work and in the community. Additional information on reducing waste at events can be found here. The City of Cleveland offers a commercial waste collection service, which is professional, reliable and affordable. In addition to providing services to public facilities such as Burke Lakefront Airport, Cleveland Convention Center, West Side Market, and public utilities, the Division of Waste Collection and Disposal works with several local businesses, including restaurants, churches, manufacturers, and contractors. The Mandatory Automated Waste Collection program represents a significant step in Cleveland to encourage more participation in recycling. Through this program, residents receive sturdy garbage carts for trash and recycling, which are wheeled to the curb for weekly pick-up. The Office of Sustainability, in conjunction with the Cuyahoga County Solid Waste District and the Delta Institute, conducted a series of workshops and case studies to reduce the impact of electronic waste (e-waste) on the Great Lakes in 2012. The focus was on life cycle analysis, procurement planning, recycling, and proper disposal. Composting at the West Side Market commenced on June 25, 2010. A 6-month pilot gathered data on the amount of compostable material produced at the market, the savings to the City through landfill diversion, and the demonstration of a best practice to the community. The grant-funded pilot turned into an ongoing compost program in 2011, resulting in an average of 1 ton/week of food waste diverted from the landfill. The City has used EECBG funding to support the resource conservation components of deconstruction, paying for the additional labor, time and equipment costs associated with sorting and processing recovered materials. As a result, building materials are reused instead of going into landfills. The City of Cleveland will utilize the experience from this project to develop strategies for material recovery and deconstruction, and draft specifications and policies to expand material recovery and reuse from our residential demolition and deconstruction efforts. We are committed to leveraging Cleveland’s resources to create a sustainable deconstruction program that helps drive up material recovery and reuse while putting people back into meaningful employment. The City of Cleveland installed 70 downtown sidewalk recycling stations as part of its initiative to reduce or divert recyclable content from landfills. The stations are designed to encourage residents and visitors to recycle, while increasing visibility of the City’s recycling efforts.